Click here for latest news. As Ukrainian family of artists Elixir Strings - refill! Welcome to our ranks guru Ukrainian gothic movement - Fritz Inferno (Sergiy Bestuzhev) - founding father and undisputed leader Infernos Band. Defending our country heroically killed the ex-guitarist of the band Inferno - Dmitro Sumksiy... Memory Eternal Hero! "On the first day of spring band INFERNO pleased to present single 2017 - Glorious Ukrainian women - "Free""
Happy Birthday - Galina Yovenko!!!! 2017-01-21 In Krakow (Poland) in "Kawiarnia Literacka" opened solo exhibition "50x50"
Congratulations to founder and leader of Inferno band Fritz and his wife Anastasia's with the birth of son! Today drummer Inferno Victor "SAV" Bilan - the father of two girls and Martochki & Alice! Congratulations to Victor and Inna! Inferno band, concert Welcomes the Director - Eugene of marriage! Uiiiiii! The band will take part in Charity Festival "REBEL" which will take place from 09/07/2016 to 09/11/2016 in the city Chekasy in areas Kozatskoy Fortress " Dahnivska Sich"
INFERNO band takes part in "BLACK SEA METAL FESTIVAL 2016"
"UKROPEN" has become symbolic for our band INFERNO. CD is remind endless struggle for Ukraine. We don't just believe in a strong nation, also we try to help. We have the support of the countries, that replicate CD ''UKROPEN". We grateful to Mick Dziuba, the director "Overdrive" wave. "Glory to Ukraine!" for everybody, who struggles under yellow-blue flag. SONG Inferno "Voice of Blood" became in a patriotic collection "UKROPEN"
SONG Inferno "Voice of Blood" became in a patriotic collection " STEEL BEAM WILL - Volunteers"
Faerie report web-zine Gothic Lady webzine from the inimitable Catherine Orchid of the concert "The Cave Party gothic" complemented by excellent photographer Anton Korepanova. on 14 December 2014. Kyiv club "Bingo"
"Independence Day of Ukraine - Inferno prepared gift: We present you our new single - "VOICE OF BLOOD""
POSTMIX Sound producer: Ilya Ivashchenko (Natural Spirit, Darnica, Parabola, Varonin Band). Sound Director: Vadim Muschenko (Natural Spirit). Have a nice listening! The brand new official INFERNO (UKRAINE) Mobile App is now available! Stream our music, see pictures, check out our bio, and share it all with your friends. Stay connected for the latest updates from INFERNO (UKRAINE) on your mobile device with our free Mobile App. Photo and video reports concert in Zhytomyr Inferno first took the stage with dance show "STUDIAS"
Sounds like a complete work on two new songs, one of them, as we promised, we will be in Ukrainian! INCREDIBLE! The concert at the "BINGO" to the scene to carry out final song singer FOUR! Photos from the concert in Kyiv (UA) club "Industrial"
"INFERNAL PHOENIX TOUR 2012" - KYIV (UA)club "Industrial"
New live video of the new song "Arrow"
The gallery added new photo "Rehearsal Inferno or how it saw of Zaira"
The band will participate INFERNO 31 December fest "Rock Stars New Year 2012" which prohodyteme the club "BINGO" (Kyiv, UA)! The gallery added new photo "Rehearsal Inferno or how it saw of Felix"
Held audition candidates for the position at the microphone. Watch with us! As part of the group updating! The Panel INFERNO joined bass player - Vad Grek! Known for his work in the group Natural Spirit! ANNOUNCEMENT OF THE NEW: As part of the group updating! 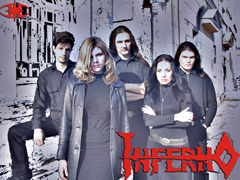 The Panel INFERNO joined Ivan Popov (keyboards) known for his work with groups: Chur, Natural Spirit, Mysterya, and more. ANNOUNCEMENT OF THE NEW: The Panel INFERNO joined Dmitry "Tiamat" (guitars) known for his work with groups: IDOL, Vicious Delight, Shtat, Wild Garden. After many changes, distributions, care, etc. I (as a founder and permanent leader of the group) decided to dissolve the group's Inferno and the new blood and Dreams forces take on why devoted his last 17 years of life. Despite all the rumors and false prophecy, a group in Inferno ranks and prepare to fight back with a new composition. So it was back in 1996, then in 2000 and 2005. Inferno have always been quality and exclusivity, and remain true to their spirit! fall Inferno announces a new program, a new structure and a new style! One Ukrainian promotional agencies embarked on the financing and promotion of the new album Inferno. This work is very different from all the previous works of the group and will surprise even the most "educated" fans. The release of the album belongs to this fall and will be available not only Ukrainian, but also European consumers. ATTENTION! In April this year, the Group INFERNO has studio Blacklight recording studio to begin recording their new album! In the future, all will be a very interesting information about who priymet often in his creation! The working title of the album "NATO MORTO" (born dead) .. Until next time, and we are waiting for you at our concerts! V.Pastushaka dedicated group "Ynferno." Enjoy, dear friends, after living through art lovers! We invite all fans as visual and musical art! Team Inferno today marks 16 years of age. Thank you all for your love and patience! See you at the concerts! 03-2009 Chernigov of "METAL Maidens" club "Alternative 38"
03-2009 Kyiv of "Rock\'\'n\'\'girls Fest" in a club "Bingo"
05-2009 Kyiv of SIRENIA (Norway)+ INFERNO (UA), CONQUEST (UA) - in a club "Bingo"
December 24 th of this year, unchanged from the director and tour manager Chosen I Birthday! The entire structure of the Inferno congratulates him on this holiday and wish you every success in personal life and in business! Happy Birthday, Oleg! December 20 at the legendary bass guitarist INFERNO Alexa Punkera - birthday! Yana (whose voice is in Not Angels and Ressurect albums) is back after a long time of astray. INFERNO took part in a concert in honor of the birthday of the famous Ukrainian band "CONQUEST", for microphone was this time keyboardist ... Diana Larionova! Max WARfolomeev becoms INFRERNO drummer. Inferno played a concert in the city of Chernihiv, in the premises of the club "Alternative 38"
14-00 Today news portal e-motion ONLINE hold a conference with one of the oldest Ukrainian gothic-metal groups INFERNO. Has reached an agreement with management on the performance of the group INFERNO to the party, devoted to the HALLOWEEN holiday. This will be the first performance of the group in Chernigov in the new structure. Inferno Songs now on your mobile. Four songs INFERNO group will participate in the WAP-project "MUZ-djuice" (Kyivstar). Company "Start Mobile", being a partner of "Kyivstar" company holds a contest "MuzDjuice", in which there is a contest of musical creativity of young artists in the form of ringtones. You can support their favorite artists by downloading and vote for their favorite band. project was implemented in the form of WAP-site, where you can download music and vote for them. See the WAP-site you can at startwap.net/star/ and on the WEB-site www.djuice.com.ua . Alex Punker returns to INFERNO. Singer INFERNO group, Sophie - married! Our congratulations and best wishes to the young family. INFERNO is 13 years old. Today the band manager's Inferno, Choisen - married !!! Congratulations! Only for him, the group sang at the celebration song "Ostansya with me" during which young zatantsbvaly your first dance! New issue of Gothica, Ukrainian gothic magazine: the cover is decorated by picture of Diana and Sofiе. Inferno begins collaboration with drummer - Kipriyanov Alexander, who has worked with bands:Vicious delight, Burial Crape. Abdy Gone leaves INFERNO. INFERNO says stopping all gigs for the near future. New bass guitarist Denizz debute with Inferno in Lutsk, Ukraine. Karaoke versions of some Inferno songs were added to AUDIO section. Inferno is negotiating for a gig in Lutsk, Ukraine by end of March. Inferno has taken part in the gig with Umbra et Imago (Germany). It so happened that at this concert Inferno played without a bass guitar. Alex Punker has left Inferno. Inferno gallery is fully operational now. Inferno has taken part in Dead Silence Fest together with Stоrmhold (Belarus), Conquest, Natural Spirit, Nolens Volens, Damonium. Inferno wishes Diana all the best on her birthday! Inferno wishes Sophie all the best on her birthday! New site design is implemented. Official Inferno Channel is open at YouTube. Official Inferno forum is open at Ukrainian Gothic Portal. First interview of Sophie for Vazhky Natysk web-zine. Our e-mail form is updated. Now you can send e-mail to the band manager and each band member. On Dec 16, 2006 Inferno takes part in DRIVE! festival with Epidemia (power-metal, Moscow), Conquest (power-metal), Nolens Volens (hard-heavy), Bila Veza (heavy metal), Jakob's Ladder (hard rock). Inferno has started rehearsals with candidate vocalists. 3 December 2006, the vocalist leaves band Ivanna "YANA" Yarema. Inferno takes part in Black City festival in Chernihiv. Inferno takes part in Ukrainian Gothic festival "Children of the Night 3"
This is a new interview with the band in "5 Ballov" magazine. Inferno breaks through into another Kyiv magazine. Inferno prepares Rise from the Dead for re-release. On July 23, 2006 Inferno is 12! Our fans have presented us the band phone +3806713-666-**. Inferno works hard on the new playlist. At current gigs you will be able to hear 4 new songs. Negotiations started on Inferno participating the International Annual Festival "CHILDREN ON THE NIGHT. Kyiv: 54 TONS with FLESHGORE, Inferno, APOCRYPHAL, WITCH HUNTER, LITTLE DEAD BERTHA, MENTAL DEMISE, MOURNFUL GUST, NATURAL SPIRIT, F.A.I.T.H., GRIMFAITH. RockArena: Participated: CATHARSIS, SUBMIND, SUNRISE. Unfortunately, due to the fact that some of the equipment did not correspond to our concept of high-quality equipment, the Inferno could not take part in the concert on December 2nd. We apologize to everyone who would like us to hear at this concert. Inferno does a Helloween party in Kharkiv. Inferno takes part in Ukrainian Gothic festival "Children of the Night"
. In addition to audio, the disc contains a section for PC with videos, photos, lyrics. INFERNO took part in the Festival "Emerald Eyes presents: SMASHED GROUND"
playing as: Te Deum, Witch Hunter, Asguard, Grimfaith, Malinconia, Bila Tower, F.A.I.T.H. Day 2: Mental Demise, Castrum, Holy Blood, Conquest, Natural Spirit, Apocryphal, Dialectic Soul, Temporary Sufferings. Video clip Falling from Heaven from the new Inferno album was presented on a big screen in Maidan Kyiv club. The Rise from the Dead album release is planned to September, 2005. Inferno has started their new program in English. Remake of one of greatest hits of 1970s included! INFERNO first visited the city of Sevastopol (Ukraine) concert. in BUNKER club. INFERNO took part in "Black Hail-Wind of Change" held in the city of Chernihiv, in "Summer Theater" with: MASTER, BUTTERFLY TEMPLE, INFERNO, WITCH HUNTER, CRYSTAL SWORD, NATURAL SPIRIT, HOMOFERUS. Inferno was 10 years old! Birthday was marked in a night club "Prime" in Kyiv. INFERNO took part in the festival "UkrMet: Northern Strike" which was held in the concert area "Green Theatre" in Chernihiv, the festival also played: NOCTURNAL DOMINIUM (Chernigov), Inferno (Kyiv), FIRELAKE (Kyiv), WITCH HUNTER (Kyiv) , REMORSE (Chernigiv), IMPERIA (Kremenchug). GrimFest: NOCTURNAL DOMINIUM (Chernihiv), FIRELAKE (Kyiv), GRIMFAITH (Kyiv), Inferno(Kyiv), TE DEUM (Kyiv), SHMELY (Moscow). I would like to mention an important event, in April 2004. A World Rock anthology "Legends bizarre edge" in other words: "Encyclopedia of Ukrainian ROCK" (O.Yevtushenko), where the band INFERNO takes pride of place in the legend. VADER Battle In The East Tour - April 2004. VADER, the legend of Polish death metal visits Kyiv! Also starring: Inferno, UNERASE, AMBIVALENCE, X-RAY. A gothic gig in Odessa, PLANET HOLLYWOOD club, with Inferno, WILD GARDEN, IRIY, VERESK. INFERNO spontaneously performed at Gothic patio acoustic version in the capital club "Prime"
JOLLY ROGER session with FLESHGORE, Inferno, WITCH HUNTER, AMBIVALENCE, WILD GARDEN, GRIMFAITH, CHARON. The Masquerade session with Inferno, FIRELAKE, WITCH HUNTER, GRIMFAITH, DISCLAIMER, WILD GARDEN, GRIMFAITH, WILD GARDEN, DISCLAIMER. Chorna Pravda Records has released CD Ukrainian Gothic including Inferno song Falling. Inferno takes part in COREFEST in Utugi club, Kyiv. The gig was headlined by Pungent Stench (Austria). Inferno takes part in extreme music gig EXTREME VISION Open Air 2003 will be held on August 23-25 included into the historical festival in the White Swan fortress. Inferno took part in the Festival "The Great Commandment" which took place in Kyiv, in the concert hall "Leningrad"
Contract with Atlantic is signed for CD-publishing of Not Angels. Unlike the released MC, the CD will contain also the two new singles ("Be with Me" and "Falling"), karaoke for "The Ballad of the Bird", acoustic versions and live video. Shooting for videoclip of "Be with Me" if finished (ed. S.Jdanov, cam. D.Jdavov, prod. A.Zolotuha). Inferno takes part in the Festival "MONSTER OF ROCK Rus-Ukraine" which took place in Kyiv show park "Kyiv Rus"
Inferno enters the battle of the bands against Unraise at the podium of Pulse of Asphalt. Inferno's drummer is 2,5 hours late, and Inferno takes votes in Internet to take the first place in Pulse of Asphalt Top Ten. And we are there for 8 weeks! Finally our album Not Angels is released! Limited MC publishers are Era Music and Western Thunder. We are planning also to release a CD. in Kyiv cinema "Kyivan Rus" is a presentation of the album "No Angels"
Inferno's drummer Andy becomes happy father of a small girl named Kathy. Inside the cinema "Kyivska Rus" took the band's performance with new vocals Ivana. The new album "Not Angels" is ready and waiting for publishing. Now you can listen to demo parts of all songs from the new album or download a full demo of one of the songs. Work is continuing on the creation of the album material "No Angels". We finished the album cover. Finished work on the accumulation of material in the studio "Arcadia" on the album "No Angels". Arkady Vikhorev sound director. Made first test layout cover of the new album. Recording of the "No Angels" CD'2001 songs has started in Arkadia studio (Kyiv). INFERNO visited the festival "Our Rock" in Kryvyi Rih (Ukraine) with bands BB, Airplane, Grand Flo and others. Live-album "Osvyntsovannoe" Some music critics dubbed as gothic-rock, others as new metal. Listen! INFERNO takes part in the Festival of Dedication opening and conduct of motorcycle season motoklubom "SILVER BULLETS", Kyiv, SC "The Seagull" with the "Marshall Plan", "Radio Rock"
under the direction of Valery Panchenko sound engineer in the studio "RS" recorded the album "Queen of Darkness"
n 1998, the band is back on the global change of vocals is Alina Kazarian has long been the keys. Inferno took part in a rock festival "Power Perfect"
INFERNO participate in the filming TV show "This is us" Rubrics "Friday Rock" channel "TET-A-TET"
in DC DVRZ (Kyiv) to the public was presented a new album "Hell He calls" with the Mystery, Whimsical Savage and Adem. For technical reasons, left the band drummer Denis Davidyuk. in connection with departure for permanent residence US singer Anastasia Rudenko. © Copyright 2006 Inferno (ISBNC 30135124). All rights reserved.